Stay up to date with the latest news, check out OCLP Twitter and Daily Digest. For recent posts, please scroll down to the page bottom for the latest posts. UPDATE: Check out this list of events happening around the world (updating) and find out more details in the Take Action page. 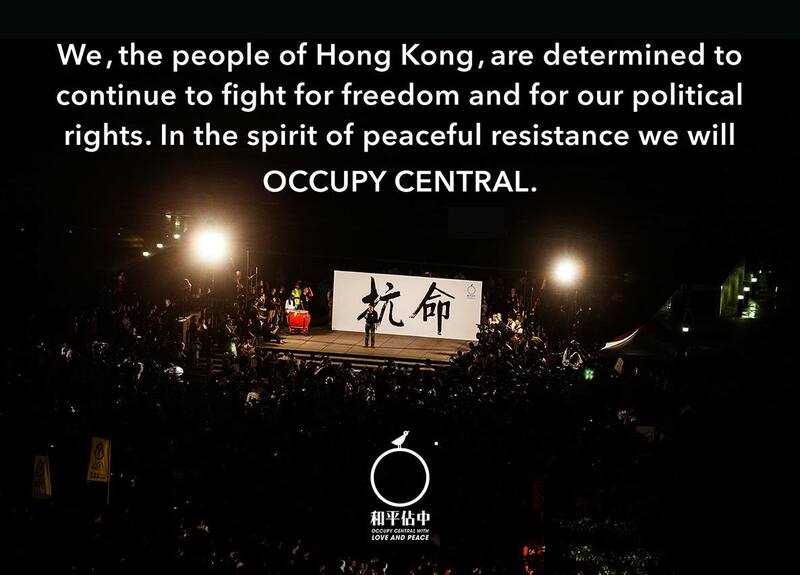 Occupy Central with Love and Peace (OCLP) is a nonviolent direct action movement that demands genuine universal suffrage in Hong Kong in compliance with international law, in particular one-person-one-vote and the right to run and be elected to office without unreasonable restrictions. On August 31, 2014, the Beijing government rejected demands for free, open elections for Hong Kong’s next chief executives, breaching the international agreement it signed on in 1984. OCLP and allies in the pro-democracy camp pledged an era of peaceful resistance in defiance of Beijing’s hardline decision over Hong Kong’s political future. Follow us on Twitter to get updates and join the conversation, and check out our digests for regular news roundup. The people of Hong Kong are fighting an uphill battle. The freedom struggle is going to be a long one, as we are trying to build the democratic culture Hong Kong has never had from the ground up. Though focused on a small place, Hong Kong’s struggle for democracy, for a just and fair society, is part of a much larger struggle, a global struggle. We hope you will join us in the fight. This blog is an archive of official statements, news articles, commentaries and multimedia related to OCLP and Hong Kong’s democracy movement. Journalists, here’s our press kit for you.